Is there any better feeling than coming home, making yourself a piping hot cup of coffee or tea, kicking up those tired feet onto a nearby coffee table and just relaxing in your living room after a long day’s work? I think not! However, coffee tables come in handy for much more than resting your feet- they provide a place for serving trays when guests are over, lend a surface for decorative ornaments that amp up the look of the room and can even be used for expanding storage options! After selecting the upholstery and sofas, the next most important item of furniture is the coffee table. Read this guide to find out which one is a perfect fit for the lounge of your house. Usually situated in the heart of any living room, a coffee table carries a tremendous amount of influence on the milieu of the room. An entirely wood-finished coffee table is often chosen to match wooden furniture. However, a tasteful way to soften the antique look is to choose industrial-meets-contemporary styled coffee tables that have wood surfaces supported by steel frames. 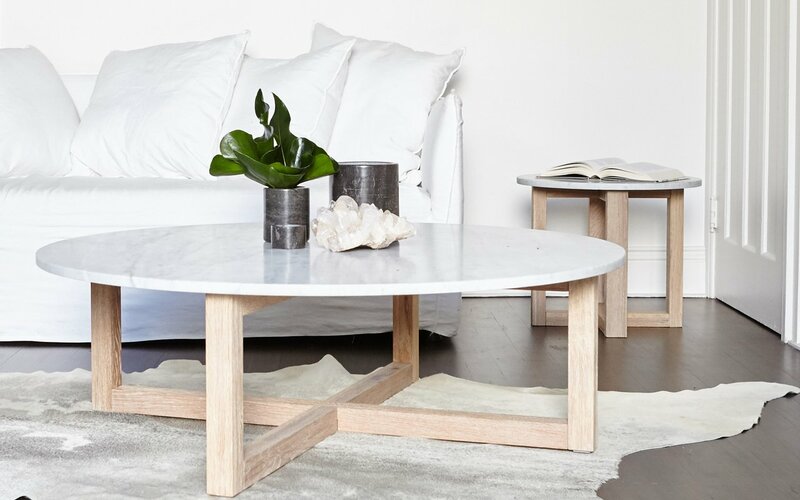 For the pure modernists among us, a sleek high gloss coffee table that complements the upholstery definitely works, but a primary, neutral-coloured wood table can be a captivating, albeit unconventional, alternative. Dark leather sofas tend to go very well with marble and stone coffee tables. Depending on the theme, glass tables add a delightful touch to minimalistic lounges, whereas those with a contrasting wood finish might just be precisely the sort of eye-catching detail the room needs. The shape of your coffee table has a lot to do with the layout of the rest of the furniture. Rectangular coffee tables contribute to structure and modernism to a room, while oval ones subtly dial down the severe, straight lines of contemporary seating. Round coffee tables are best where there is plenty of space, whereas square ones are ideal for smaller rooms. It is important to note that the height of the table must be in line with, if not slightly higher, than the seats of the sofas. This will give the room a more balanced look and is critical for comfort. Don't let a shortage of space hold you back because there are plenty of excellent coffee tables that aptly address this concern. What’s more suitable for space-saving than an extendable coffee table to maximise the utility of the area available? These come in various sizes, with under shelves or built-in drawers that can be used to put away clutter. Some have lifted up tops and rotating elements for those who love convenience. Worried about aesthetics? Not only are these a highly efficient way to save space, but they also look quite elegant. Either way, buying one of these is a win-win situation. Whether you're looking for utility or design in your coffee tables, Furniture in Fashion has got you covered. Check out the latest collection available at the most amazing prices.